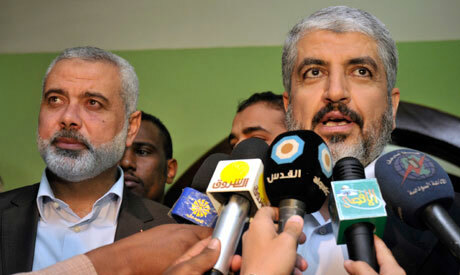 Hamas leaders Khaled Meshaal (R) and Ismail Haniyeh (L), (Photo: Reuters). The four-day violent flare-up that began with Israel's assassination of the leader of the Palestinian Popular Resistance Committees on Friday quickly escalated, with Israel launching multiple air strikes against a host of Palestinian targets. Throughout the conflict, which ended early on Tuesday with a ceasefire after killing 25 Palestinians, Palestinian resistance group Hamas said it was working to restore a truce with the self-proclaimed Jewish state. The group also kept its fighters out of the fray, opening it up to criticism from other Palestinian resistance factions. "Hamas is now in power [having swept 2006 Palestinian legislative elections], and governing requires both rationality and responsibility," said Mukhaimer Abu Saada, a political science professor at Gaza's Al-Azhar University. "The group wants to maintain the truce [with Israel] because it doesn’t want to be dragged into a war in which it would be the biggest loser." The latest confrontation served to put Hamas in the awkward position of trying to rein in the armed resistance that it has long espoused, according to political analyst Akram Atallah. In the last round of violence, the group faced two options, Atallah told AFP: “either rush into a battle that would lead to a major escalation, which would threaten their people, institutions and power, or to sit on the fence, which is what happened, and leave Islamic Jihad by itself in the battle." "The first option is very costly for Hamas and could cost it its power in Gaza," Atallah added, saying the Islamist movement was anxious to avoid a repeat of Israel's devastating 22-day “Cast Lead” assault in 2008/09, which led to the death of some 1,400 Palestinians, most of them civilians. Hamas's position didn't go unnoticed by other Palestinian factions, with Islamic Jihad publicly censuring the group’s efforts to end the violence via Egyptian mediation. Hamas spokesman Taher Al-Nunu, for his part, rejected the criticism, dismissing claims that the group had abandoned the principle of armed resistance. "Hamas responds [to Israeli aggression] at the time and in the manner that it considers most effective," Al-Nunu told AFP. "Resistance is a strategic choice and, on the contrary, the [Hamas-led Gaza] government has created an environment that supports resistance," Al-Nunu added, stressing that Hamas had given armed resistance groups "a free hand to respond to the crimes of the [Israeli] occupation." Naji Shurrab, an Egyptian professor of political science at Cairo’s Al-Azhar University, said Hamas was effectively forced to allow militants from Islamic Jihad and other groups to fire rockets at Israel. "It allowed resistance factions to respond [to Israeli aggression] so as not to contradict its stated position on armed resistance and would not appear to be abandoning the resistance option," he said. According to a source close to Hamas, the group took a strategic decision not to participate in the recent round of violence. "The decision was a message from Hamas to Israel and the international community," he said. "The message was that Hamas is not the aggressor and is not seeking a war." Hamas, the source added, had learned from its earlier experiences. "Neither Hamas nor the people of Gaza want a war,” the source went on. “Any group can say whatever it wants, but the only [Palestinian] faction that can engage in a real war with Israel is Hamas." He added that Hamas was not interested in an escalation in the Gaza Strip “because there’s no possible political advantage in it." Despite Hamas' public shows of confidence, the group’s stated terms for a new ceasefire with Israel point to a desire to please its Palestinian constituents. Hamas officials said they would only agree to a ceasefire if Israel pledged to give up its longstanding practice of targeted killings – a condition that had not been raised previously. Egyptian officials who announced the truce early on Tuesday said it contained an Israeli pledge to end targeted killings, although Tel Aviv has since denied making any such promises. Shortly after the truce supposedly came into effect, Hamas declared that "any Israeli violation requires a strong response by all [Palestinian resistance] factions."